Translators can be bought for a few hundred credits and are usually installed on portable computers, clothing, jewelry or sub-dermal implants. They can also be found on the extranet, with governments providing software near spaceport customs facilities. 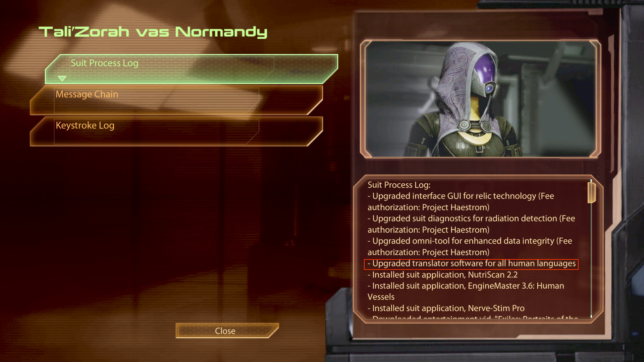 An interesting example of translators used in canon: the Shadow Broker dossier showed Tali downloaded an upgraded translator software for all human languages in her suit process log during the mission on Haestrom. It’s likely she did it once Shepard arrived to rescue her on the planet. Translators are necessary. Without them, it’s harder to trade, preserve culture, or simply communicate with others. All species know this. Even batarians, who are isolationists, provide up to date information on their language. Translators are also useful to species who have difficulty reproducing sounds from other alien languages. A hanar could learn English but would never be able to speak it in a way that a human could understand. Similarly, a human wouldn’t be able to “speak” hanar, since the hanar use sophisticated patterns of bioluminescence to communicate. The hanar use sophisticated patterns of bioluminescence to communicate. Still, there is a real advantage to learning alien languages, which is why alien languages are taught in schools. Youth United, a galaxy-wide group trying to help young people who are raised by different species, offers free classes on alien languages, showing how important it is for someone wanting to understand other cultures or species. Learning an alien language can also offer a tactical advantage, as Paul Grayson realizes during a mission in Ascension. Automated translators are not always enough. Soldiers who belong in squads sent to specific war zones can also be trained in the foreign languages of that region. Example: the hastatim members, turian soldiers who were sent to the turian colony Taetrus to get rid of civilian resistance. What Happens When Translators Can’t be Used or When They ‘Go Wrong’? Species who are new to the galactic community have to wait for linguists to study their language. While they wait, communication issues might arise. A question often asked during fan discussions is: What happens when the translators stop working? 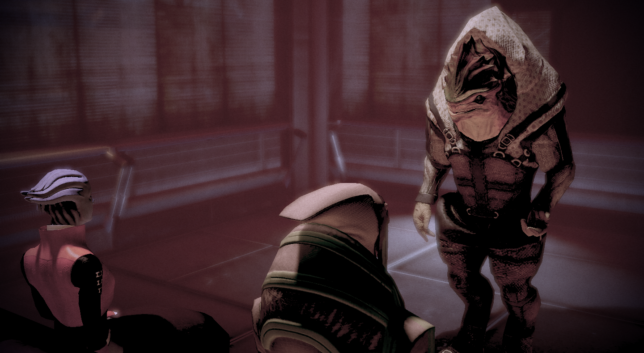 Imagine how funny it would be to see Shepard trying to understand Garrus and the “screeching” sounds he would make. Well, situations like this do happen in canon. 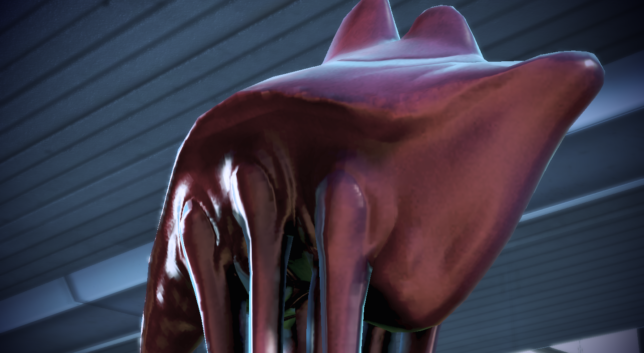 An elcor named Nockrick Taur used a jamming signal to short out every translator in the Reyanommond auditorium on the Citadel. One theatergoer explained that “people were suddenly shrieking gibberish.” In the book Ascension, a Cerberus operative named Pel went to Omega. The people there refuse to speak the common trade language unless absolutely necessary. Pel’s translator can’t translate every “obscure interstellar dialect”, instead hearing “an endless cacophony of grunts, squawks, and squeaks”, prompting him to believe his translator was now useless. The trade tongue is not often spoken on Omega. What about the trade tongue? It is used by many species to facilitate communication between them. We’ll go back to the concept in a future article. What about translators in Andromeda? This is common with SAM, who frequently doubts his translation skills. The Remnant language can be a bit of a mystery to him, as he wrote in the codex that he understands “little” of it. Meanwhile, Jaal told Ryder that the angara’s translator is very sophisticated and has a library based on every single encounter with a new species. 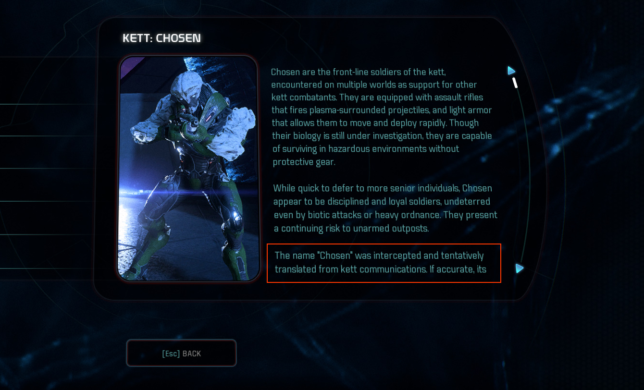 Since the kett can understand humans, it’s likely they also benefit from a similar translator program. 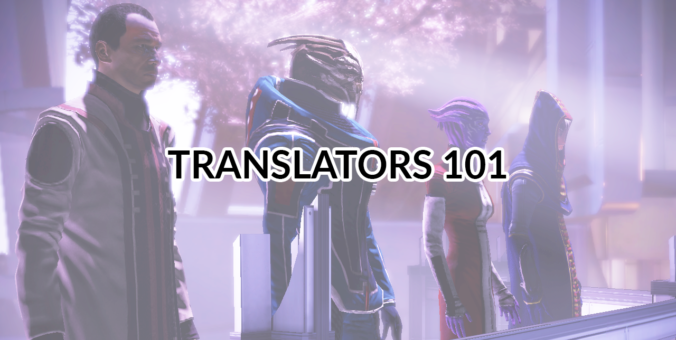 Languages classes are very much a thing in Andromeda, just like they are in the Milky Way. It’s not just for the species from the Nexus, but also angara. The angara’s translator is very sophisticated.